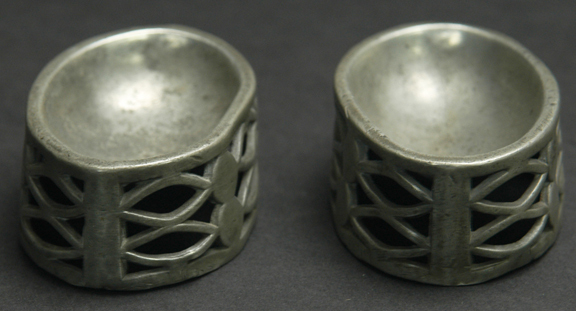 Offered is a very rare pair of 17th or early 18th century pewter master salts. 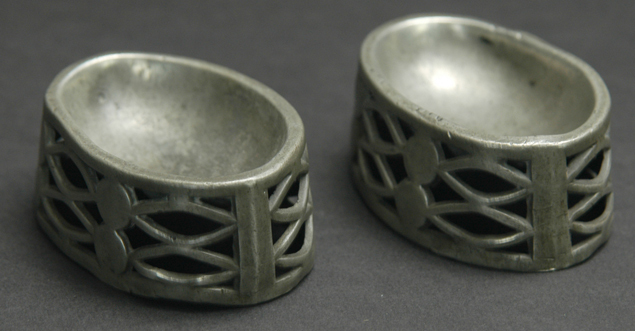 They are cast with a open lacework design around the outside, only 1 1/8" tall x 3 1/4" x 2 1/4". They have no visible repairs, a few dings and slight misshaping around top edges. There may be a touchmark on the bottom side (inside the lacework) of one, but it is too hidden to know for sure. I've looked with every kind of light I can think of and I might just be hoping for a touchmark! The closest I can find for reference, are not very close at all, but they are Hornsby's Pewter of the Western World, 1600-1850, at plates 384 (listed at German salt or spice, early 17th century) and plate 385 middle (English octagonal salt, circa 1700-20). As I said, neither of these examples are very close in appearance, but absolutely the closest I can find. The have a Spanish look to me....but that is just conjecture. These are a real find!